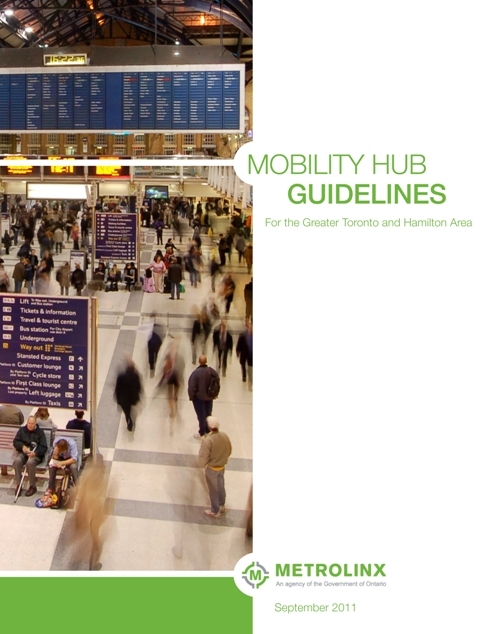 The Mobility Hub Guidelines, available below, provide a framework for the successful planning and development of mobility hubs, and address a number of key objectives. For each of these objectives, the Mobility Hub Guidelines provide detailed strategies, best practices, case studies, and suggested resources. Clearly communicate the mobility hub concept. Provide guidance and inspiration on developing mobility hub plans and incorporating mobility hub objectives into other planning activities. Become a tool and resource for Metrolinx/GO Transit, municipalities, transit agencies, developers, consultants, provincial ministries, community organizations and other public agencies. Serve as a key source of direction for Metrolinx when undertaking planning efforts or when building infrastructure in mobility hubs, or when reviewing third party plans and proposals for mobility hubs. The Guidelines are winners of the 2012 Best Project Award from the Transportation Planning Council of the Institute of Transportation Engineers (ITE), a National Merit Award in the Canadian Society of Landscape Architects 2013 Awards of Excellence, and an Honourable Mention in the 2012 Canadian Institute of Planners (CIP) Awards of Planning Excellence, in the category of Sustainable Mobility, Transportation and Infrastructure. Mobility Hub Guidelines (92.1 MB PDF)* Available in smaller sections below. *Note: If you are experiencing problems opening large PDF files, right-click the link, select "Save Link (or Target) as..." and choose a location on your computer.